Last night we scoped out some breakfast options down the street from the hotel. We woke up ready for some Bun Bo Hue. The spot was packed with locals and the soup did not disappoint. Fueled up, we headed back to our hotel for coffee, fruit and day planning. 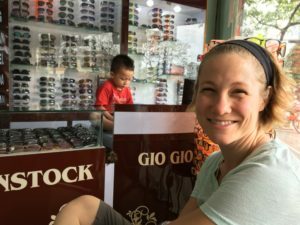 Unfortunately, Kat sat on her glasses, so we had a new pre-site seeing mission. Our hotel gave us directions to an optical shop a few blocks away. The owner had apparently stepped out for the day, leaving the young sales girl with no technician. We were off again. We walked another mile, then decided to check in with a different hotel receptionist. Highlighted map in hand, we continued our quest. Finally we arrived at our destination. The man behind the counter took the broken glasses to his bench while we watched his toddler slowly transfer toothpicks from one container to another. He was adorable and full of giggles. All fixed and polished up, the glasses were handed back with no charge! 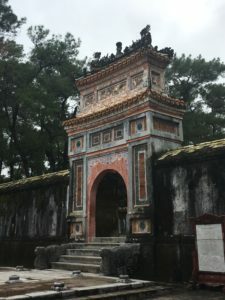 Buzzing from the kind generosity, we hailed a cab to head south along the Perfume River to check out the imperial mausoleums – Hue’s big attractions. Emperors has the mausoleums built to their particular tastes and styles. 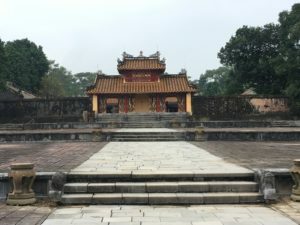 Some served as country palaces while the emperors were alive. The sites are also reflections of both the wars, and the climate – nature is trying hard to reclaim these buildings, despite them being little more than 100 years old. 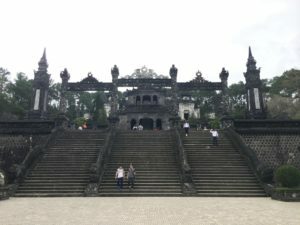 Our first stop was Minh Manu’s Mausoleum on the north side of the river. Our taxi driver waited for us in the lot while we wound our way up a path toward the site. 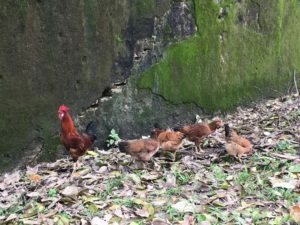 There were marvelous chickens parading around the path and Kat desperately wanted to pet them. This first site was fairly empty of tourists and we enjoyed some biscuits, painting, and reading overlooking the complex. When we arrived back at the lot, our napping taxi driver was ready to take us to the next site. 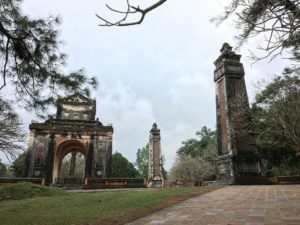 Khai Dinh’s Mausoleum was inspired by a European castle and the emperor’s infatuation with the French is palpable. Most of the site is built from cement rather than carved stone which has turned black with age and is covered with delightful neon moss. The inside of the mausoleum itself is ornately decorated in tile relief. We enjoyed a view overlooking the grounds while it quietly rained outside. Hungry, we decided to drive back into town for lunch and an ATM. 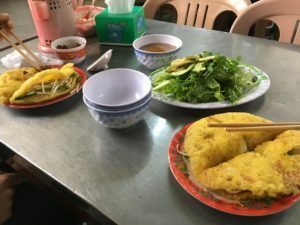 Lunch was banh khoai, a deep fried pancake with bean sprouts, pate and shrimp. 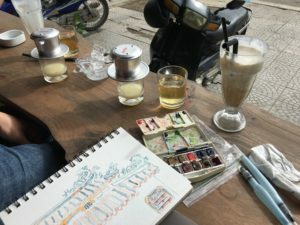 After lunch we found a sunny coffee shop to enjoy milkshakes and some more painting/reading. 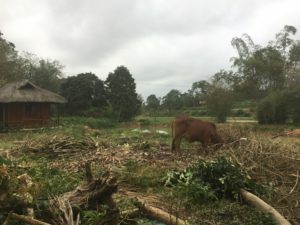 Afterward, we hailed a cab south again to Tu Duc’s Mausoleum, the last of our old-dead-king sites for the day. This emperor had reigned the longest, therefore his complex is the most well planned and cohesive. 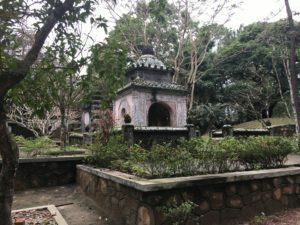 We enjoyed wandering around the secondary tombs and poking around the gardens. The complex has been renovated, and this work continues. 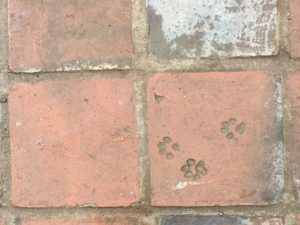 The tiles for the courtyards were apparently supplied by canine artisans whose signatures can be seen throughout the site. From Tu Duc’s Mausoleum we headed north, this time on foot. We wandered down dirt roads and around rice paddies and fancy houses. The back lanes were quite and pleasant. It appears as though some large public works have required the rearrangement of roads since our map was not exactly accurate. Regardless, we enjoyed the wander. It turned out that the road on which we were walking was new – and the cement ahead had just been laid. Thankfully, an elderly gentleman waived us on and indicated that it was set enough for us to walk on. 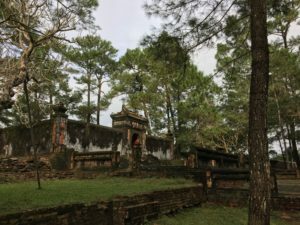 Our goal was Tu Hieu Pagoda, a site a little off the beaten path that houses an active community of Buddhist monks. 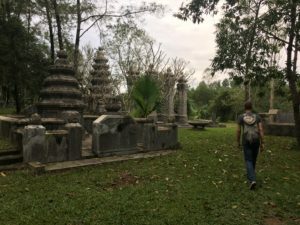 We found the graveyard behind the pagoda before we found the site itself. 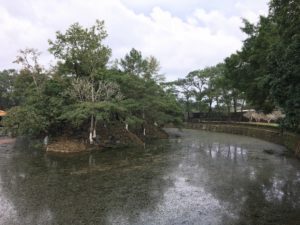 Eventually we wound our way around to the entrance of a park where ponds full of dragonfish happily swarmed for food from local children. 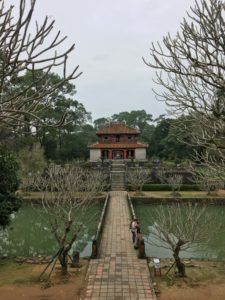 We climbed the steps to the temple and enjoyed the quiet gardens. 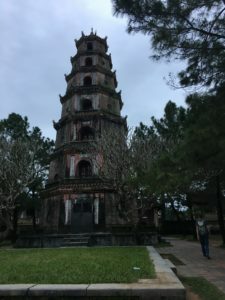 Eventually we wandered back onto larger streets and hailed a cab to Thien Mu Pagoda on the north shore of the Perfume River. 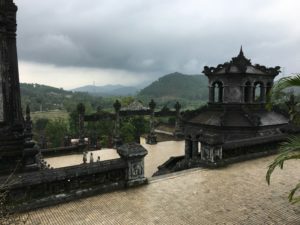 We stopped for a long cargo train to pass and arrived at the pagoda at dusk, just in time for the bats to start swooping. 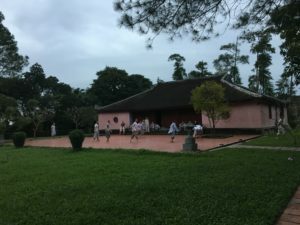 Around the back of the pagoda, young monks were playing a lively game of soccer and a local girl was having an intense selfie session. Super intense. Drained, we took a cab back toward the city and started looking for dinner. 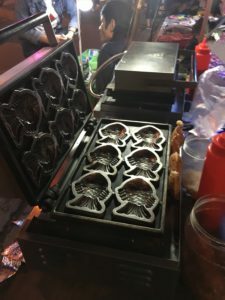 We happened upon a large street market for clothes – and the associated snack stalls. We gobbled up some Korean-style noodles and a fish-shaped waffle before looking for quieter streets and a full meal. 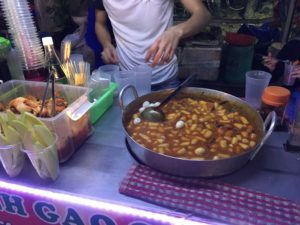 A couple blocks away, we found a banh canh stall. 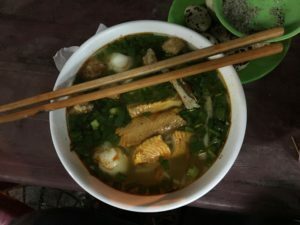 It was similar to our dinner from last night, with freshly made noodles, but with an awesome assortment of flavors and textures. There was some pate, some fish, some quail eggs, and pork cracklins, all floating in a bowl of a spicy, herby goodness. 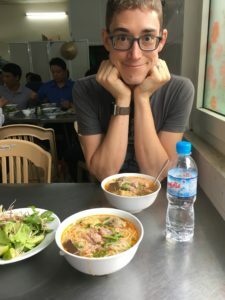 It was a great final dinner in Vietnam. Our last stop for the night was the Big C, a supermarket and department store complex. It was … overwhelming. The first floor is mall-like, with small shops, but the upper floors are all Big C. We only made it through floor 2, the grocery section. It was completely packed, loud organized chaos, like the rest of Vietnam. We got some candy and snacks to bring home, along with a passionfruit, then we were on our way. We’re all packed up to begin our meandering trek home tomorrow. We’ll spend a chunk of tomorrow in Ho Chi Minh City, and end the day in Kuala Lumpur. Previous Previous post: No Hue!